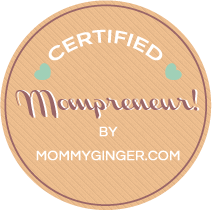 People ask me if this section where I interview entrepreneurs and SMEs are solely for moms. Of course not, guys! 🙂 Today, I’m featuring a young lass who’s single and 28 years old. Last week, I featured Ava Diaz Daza, also very young and still single. 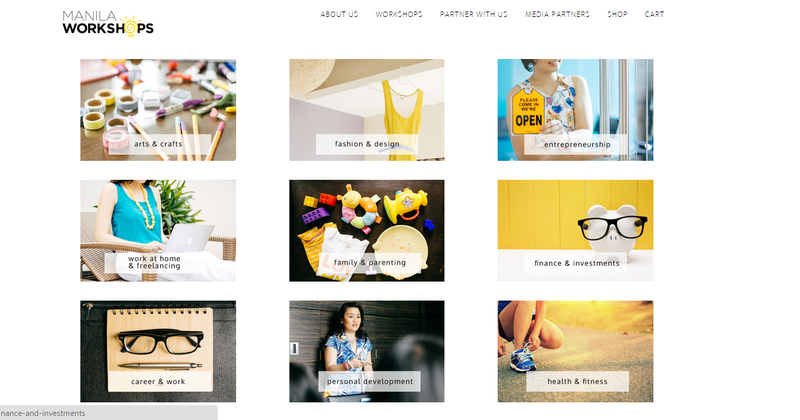 So, to answer your question, I am very much open to featuring entrepreneurs of all ages, marital status and gender! And today, I am very excited because my young entrepreneur’s business is all about making cookies, and I love love love cookies! 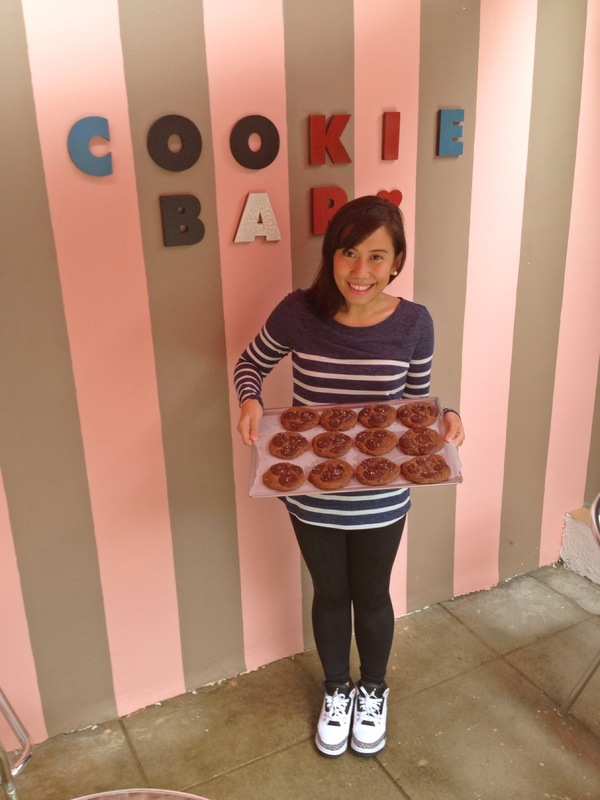 Ivorie Acosta of Cookie Bar is a 28 year old cookie lover. She loves eating, cooking and food styling! She is single but she has been together with her supportive boyfriend for 6 years already. “He’s the one who helped me with the business and he handles the finance side of Cookie Bar,” says Ivorie. This lady is a pretty laid back person. She likes staying home on weekends and she likes trying out new restaurants. She also has this love affair with New York City. 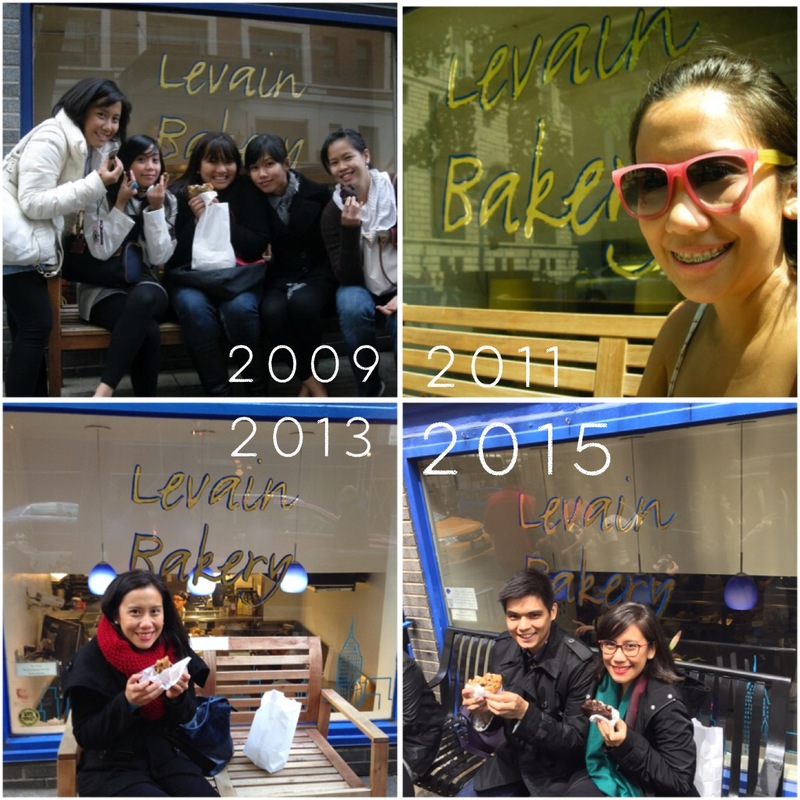 Sge goes there every other year since 2009 and she says that it’s a small cookie shop named “Levain Bakery” that inspired her to do my business here in Manila. Ginger: Good day! 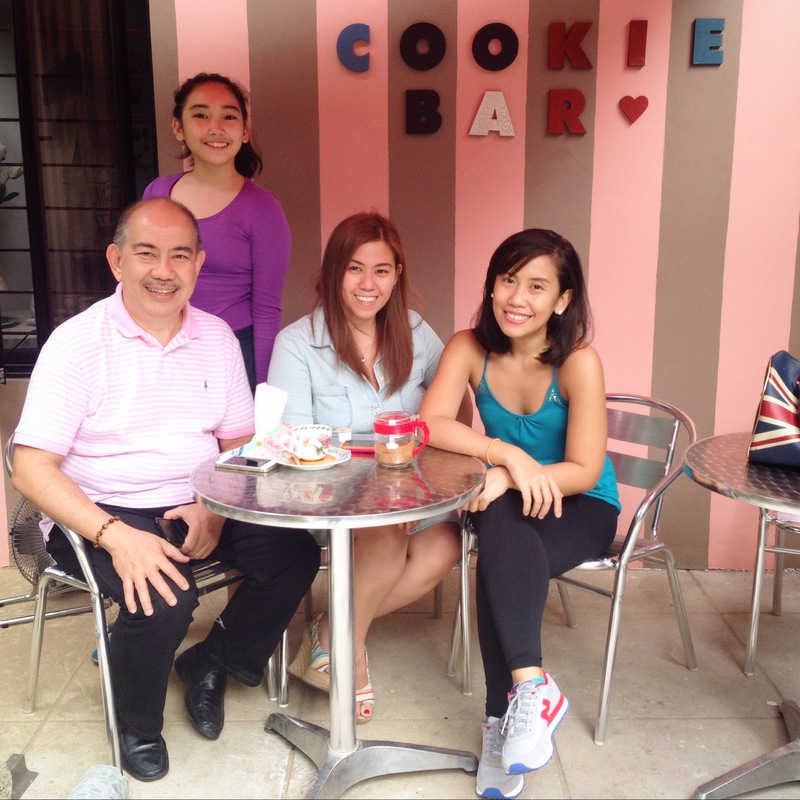 I’m with Ivorie Acosta, the owner of Cookie Bar. Ivorie, can you please tell me more about your business? What is it about? How long have you been in business? 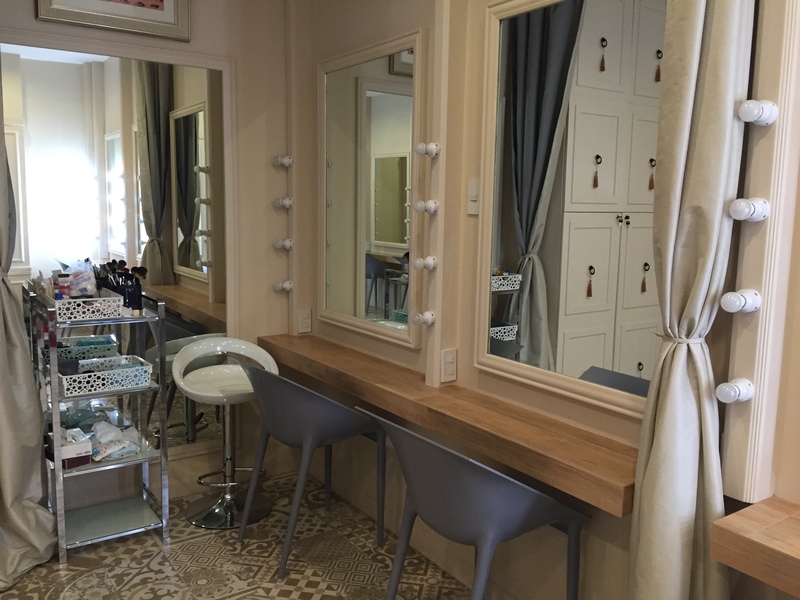 Ivorie: Cookie Bar is a home based cookie shop since 2009. We specialize on making cookies in different shapes, sizes and textures. We take pride in creating a product list that is only centered on cookies. I started Cookie Bar as a sideline business while I was still a teaching preschool during the day. My main clientele were friends, family and co-teachers. As Cookie Bar gained popularity through word of mouth and social media, the business expanded and now Cookie Bar has it’s own kitchen/commissary where people can pick up cookies or choose from the variety of cookies available daily. Ivorie: My market are young teens and young adults who love sweets! Some of our cookies are pretty rich and filled with different chocolates that’s why some older clients might not enjoy it. We try to make sure that cookie lovers of all ages get to enjoy our cookies so we make different kinds to tap that specific market. We have cookies for Vegans, for Diabetics, for people who like oatmeal, for people who like crunchy cookies or soft batch. Cookies are so simple and quick to make but each tweak in every recipe can make a huge difference is taste and texture. Ivorie: The internet is the best way to market your products. Everyone has smart phones and laptops so you have to be present in all the social media platforms. Constant posting of photos and reaching out to your customers is one way to get your products out there! Ginger: How did you come up with this idea? And what made you decide to start this kind of business? Ivorie: I went on a trip to New York City in 2009 to visit my Mom where she was based. I was really amazed with all the restaurants and bakeries in Manhattan. It’s all filled with wonderful pastries and people just come in and out of these small shops holding some sort pastry. I also noticed how cookies were such a big thing there like cupcakes. One certain bake shop caught my attention because they were known for their COOKIES! 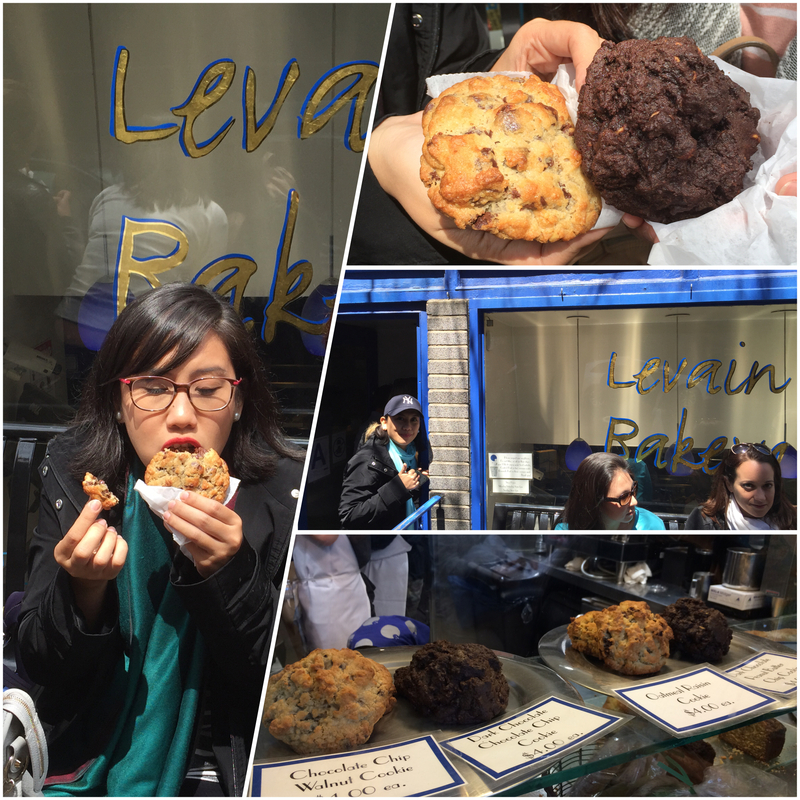 Levain Bakery is on the upper west side of Manhattan. It’s a small shop, with no dine-in area, just take out counter for cookies, breads and coffee. I really wanted to replicate their big crusty on the outside and soft on the inside cookies back home. I went back home to Manila, with so much inspiration and an idea of making cookies the next big thing. Ivorie: One of the obstacles I faced was deciding to quit my job as a preschool teacher and do Cookie Bar full time. I knew the business won’t be able to grow as quickly as I wanted it if my mind and body wasn’t 100% in it. I had to weigh the pros and cons of staying and leaving my job and eventually I had to decide on choosing to do Cookie Bar full time. It was nerve wracking not knowing If the business will really take off but now that I look back, it made me realize that it was one of the best decisions I made in my life. 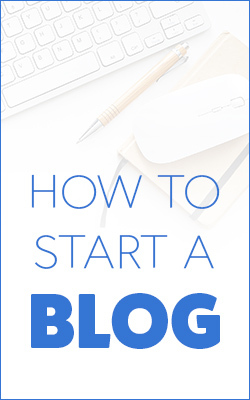 Another obstacle I encountered is not knowing how to start registering the business. It was numerous trips to the city hall, BIR and other government offices. There are forms and requirements to be submitted. I did not hire anyone to do the leg work for me. I decided that I had to do it myself to get things done quickly and at the same time, I can learn it for future business endeavors. It really was a learning experience for me. Ivorie: Passion – Without this, the business will have no heart. It will have no personality. I think customers can tell if a business is run by remote control rather than a hands on owner who has so much love to his/her products. Patience – It won’t be successful overnight. Your product won’t sell instantly. You also cannot just wait for it to sell. You have to get up and work. Drive – Ask yourself what drives you to do this every single day. Is it for your future, to help others (like your employees), is it to help your family? Every person has a different reason why he or she will start a business but if you focus on a certain goal and why you are doing this, you won’t get confused and get disappointed with problems that come your way. Ginger: Unforgettable moments or lessons that you learned as an Entrepreneur? Ivorie: Listen to your customers. They are the ones who can tell you if a product is good or not. If something you like isn’t really selling then there must be something wrong with it. It hard to get criticized but just realize that it’s not a blow on you as a person, it’s the product. I was creating a recipe for a certain event last year, I was so excited to launch it because it took me so many test batches to get it right according to my taste preference. In the end, my clients didn’t order this type of cookie. It wasn’t too appealing to them and I had to scratch if off the menu. Ivorie: No, not everyone is cutout to do business. It’s something you have to be mentally prepared for. Your business becomes your life. You cannot just run away from problems that come your way or even give someone a task only you can handle. If you are the type of person who can accept failure and its inevitability in life, then you can be an entrepeneur. Ginger: Thank you so much, Ivorie for such inspiring words from such a young entrepreneur. I hope you can share this inspiring article with other aspiring, young entrepreneurs! 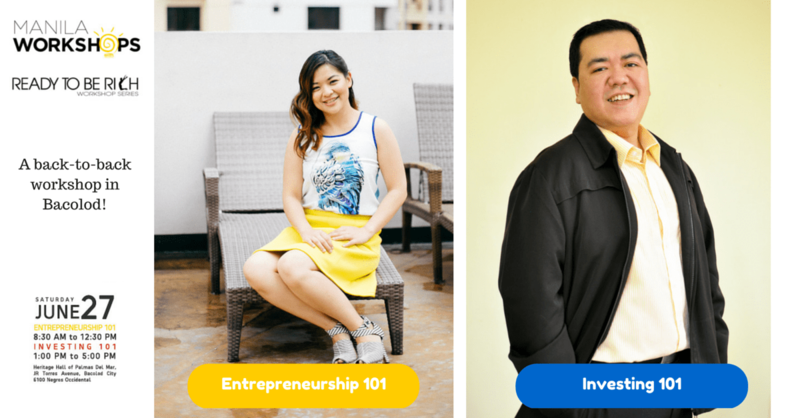 Join me for an Entrepreneurship 101 Workshop in Bacolod! A great Monday morning to you all! How was your long weekend? I had a great time! I threw a baby shower for a friend and her sister and it was AMAZING! I will tell you all about it another day. This Monday, I would like to take this opportunity to invite you to please join my Entrepreneurship 101 class in Bacolod. I know most of my friends are from Metro Manila, but please share this with your friends and relatives who are in Bacolod. 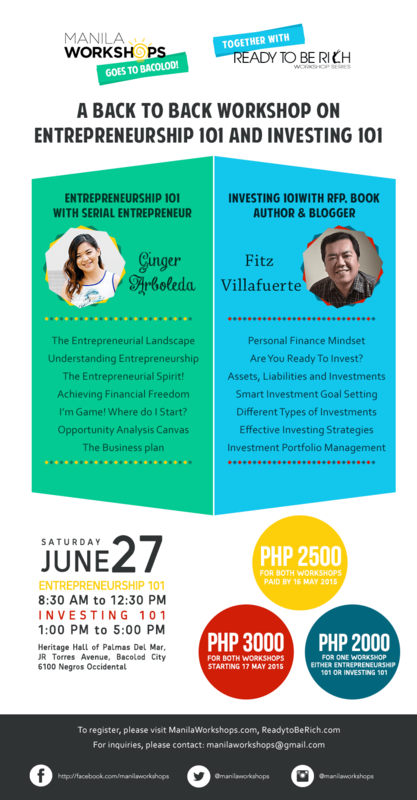 I will be conducting this class which is actually a back-to-back class with my dear friend, Fitz Villafuerte, who will be teaching Investing 101. I have received a lot of requests to bring Manila Workshops to the provinces and this is our first attempt to bring it to Visayas. I am very confident that you will get your money’s worth for these two sessions as Fitz and I really did our best to prepare for this run! Please do attend both session. For attending both sessions, the fee is only at an affordable rate of Php 3000 per participant! Fitz is a civil engineer who decided to quit the corporate world in 2003 to pursue entrepreneurship. 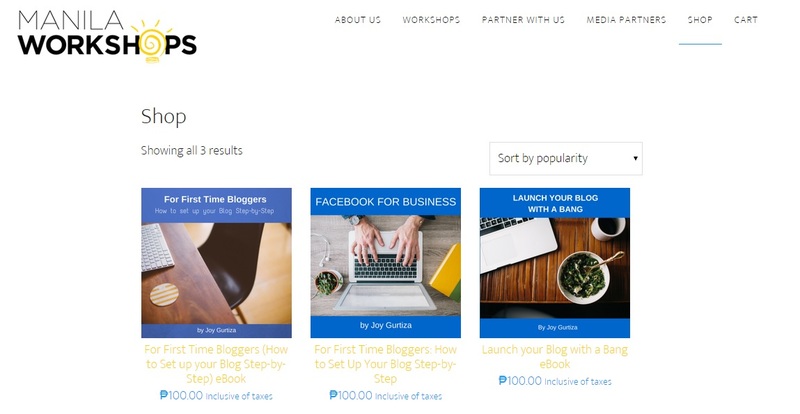 His blog, entitled, Ready To Be Rich, has already received several recognitions including the Best Business and Finance Blog at the Philippine Blog Awards for two years in a row. Moreover, an international finance publication, Wise Bread, has likewise ranked his website as among the Top 100 Personal Finance blogs in the world. Fitz has also been recognized by Moneysense Magazine as among the top 12 most influential people in Personal Finance in the Philippines. He also recently came up with his own book entitled The Ready to Be Rich Guide to Investing. He is a Registered Financial Planner and a resource speaker for corporate and socio-civic organizations in the country where actively promotes entrepreneurship and financial literacy. Ginger is the General Manager of Manila Workshops (GPA Events Management Services). She is also the Co-Founder of Turn up Trumps, Inc., a tech start-up company that creates mobile applications/solutions. She is also a professional blogger and brand endorser for brands such as Globe My Business, Sangobion, Lotte Xylitol and Pampers. She is the program director of Love the Leap, an entrepreneurship program, and the host of GTV (http://bit.ly/gtvchannel) a YouTube channel that focuses on helping aspiring entrepreneurs build a business that they want. She is a business and marketing coach, as well as a speaker on business and entrepreneurship. Ginger has built her brand to revolve around her mission of helping entrepreneurs love the leap that they took in order to start their own businesses. Ginger has also been a speaker in various events, where she talked about entrepreneurship, marketing, social media and even mommyhood! I really hope to see you there! Please spread the word, too! 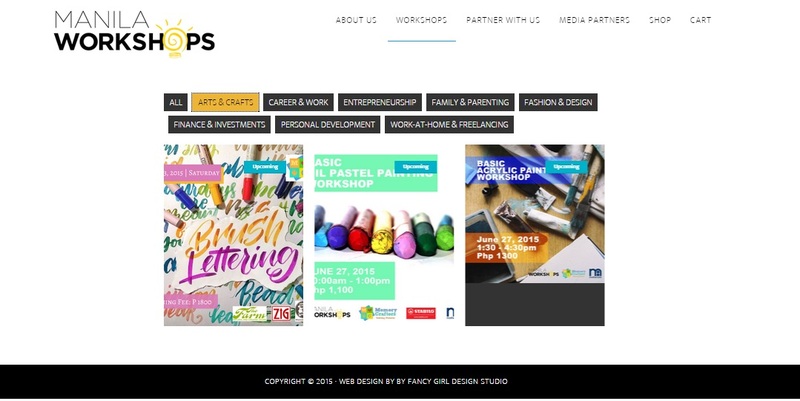 SIGN UP NOW AT http://manilaworkshops.com/events/bacolod-workshops-2015! For three years, Manila Workshops, have been giving you different kinds of lifestyle workshops and one of the workshops that we plan to sustain and really run forever (haha… if forever is a possibility!) is our Parenting Workshops, Parenting Pals and the First Time Parents Workshop Series. The First Time Parents Workshop series really aims to help expecting parents prepare for scenarios that are unfamiliar to most of us who are first time or even second or third time parents. 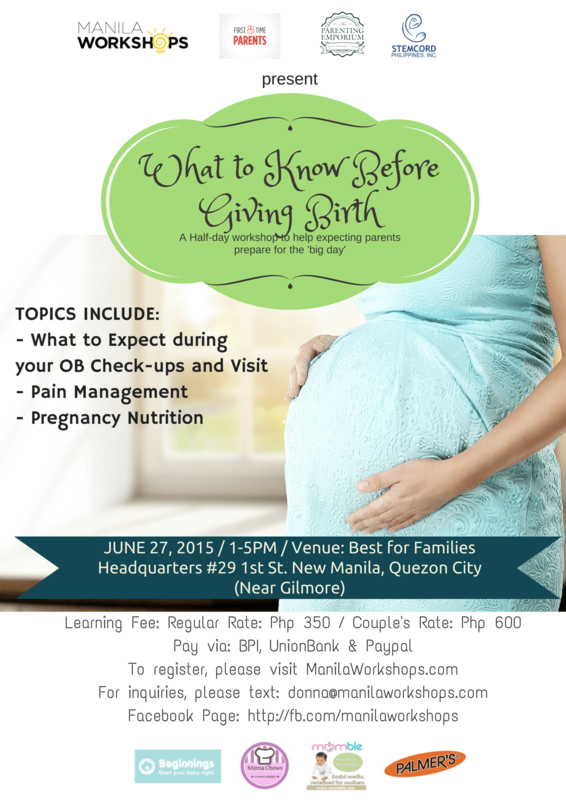 This year, we are holding the second and the last run of the What to Know Before Giving Birth Workshop on June 27, 2015. This workshop is brought to you also by The Parenting Emporium and Stemcord Philippines, Inc. Here are the details of the workshop. Luchie Callanta, RND, MSN is presently a faculty member at Center for Culinary Arts Manila teaching classes in Culinary Nutrition, Dietetic Desserts, Communication Arts, and other Management courses. She is also currently an adviser for Men’s Health Magazine. Presently, she is the consultant of Fly Ace Corporation and Armadillo Holdings Incorporated. Apart from her teaching and consultancy jobs, she is also a writer. She is currently a coordinator/writer for MAPEH series for Grades 7-10 at Abiva Publishing, co-authored “Cooking for Health Series”, and was a contributing writer/editorial consultant for Smart Carbs Workbook. She is married with 4 kids. 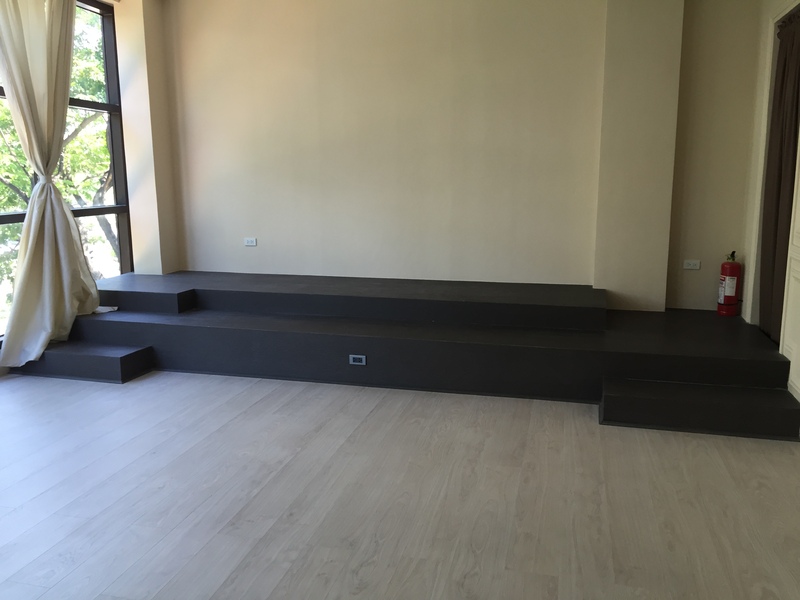 The workshop will be from 1-4 PM and the venue will be at the Best for Families Headquarters, #29 1st Street, New Manila, Quezon City. We hope to see you there! My oh my! I am like a kid who just came out from a toy store. That is how I feel now that I have my newly redesigned site. And with this newly renovated site comes super powers… haha! (I wish!) But seriously, with the new website came a new zest for this business once again. I now know where we are headed. I now know where I was going with this (haha… sometimes, I confused myself!). Anyway, first off, I will take you through the features and interface of the site. It’s pretty simple yet, I still want to bask in it’s greatness, so I just want to briefly take you with me on this tour. This is our beautiful landing page. We have stated our belief and mission in just two words — Love Learning! This is what we want you also to believe in. Each one of us need to realize, even if we are experts in our field or even if we feel we are too old already, we need to never stop learning! We are encouraging everyone to use #LoveLearning whenever you discover something new or whenever you see something that you would like to learn more about. When you click on learn more, it will take you to this really amazing “filterable” page that Pat of Fancy Girl Design Studio created. You are the bomb, Pat! We hope that it makes everything easier for you to navigate through these categories. Also, please don’t forget to leave your eamil address so that you will receive our newsletter about our upcoming events. And last but not the least, here is something which we know, some of you have been waiting for. We are launching our eCommerce platform. Manila Workshops will not only be about offline learning events, but we will be open to having individuals share knowledge and acquire knowledge from others through this platform. So what can you sell or buy from our store? Basically, anything and everything that has to do with learning! Now, you guessed it right! We have opened the platform for others who want to use it. If you are a speaker, book author, or an expert who would like to share your knowledge about a certain skill or topic, just feel free to coordinate with any or the beautiful people in my team and we will be happy to assist you. I came across a school for Personality Development in Alabang and I got to talk to the owners for almost three hours. We were talking about business, the “mommy” life, branding, etc. As a mom, one of the things that I have realized during our talk was that a lot of focus is being given by moms to developing the mind or the intellect of their kids. We send them to supplementary classes for math and science and yet little attention or no attention is being given at all to developing one’s character. I’m a Catholic and we go to church every Sunday and we pray taht she grows up to be empathetic, generous, confident and kind to others. So when I came across La Vie Institute, I was really glad they they had institutions like this. Monica, the program director, shared with me that “The Life Institute” was really created to address the pressing needs of individuals who are in different situations in their lives — from children where bullying or being bullied has become prevalent, to teens who are transitioning to adulthood, to those who will graduate facing stiff competition for jobs. Oh, they also have one for the modern woman! 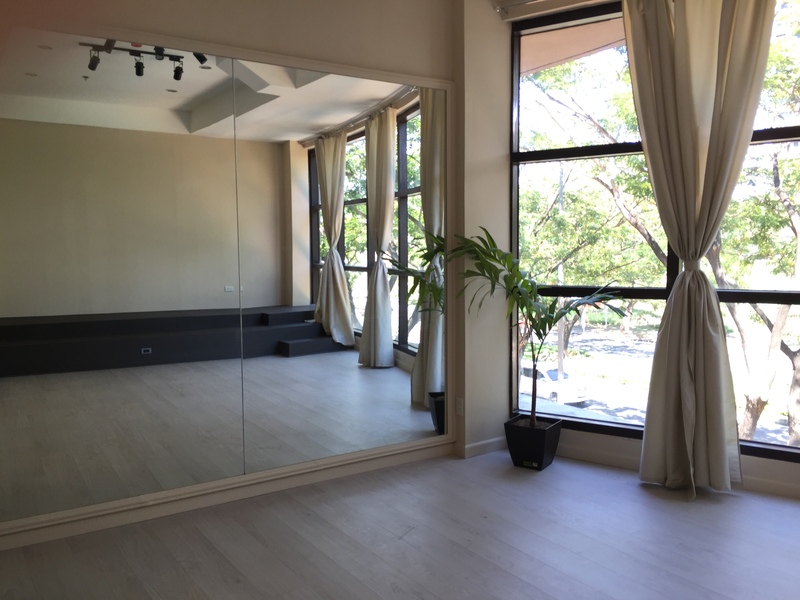 Monica mentioned that it is really their mission to hold programs that are designed to bring you the fruits of TOTAL Personality Development training to let you live “the life” you imagine for yourself and for your loved ones. Their programs are one of a kind, featuring a multi-layered design that targets all aspects that enriches a person’s habits, values, philosophy, confidence & communication skills. The program features workshops both on verbal and non-verbal communication, self-mastery, both the performing and fine arts as well as etiquette and protocol training, among others, all dealing equally with both intrapersonal and interpersonal skills. I got to tour the place and they had amazing facilities! 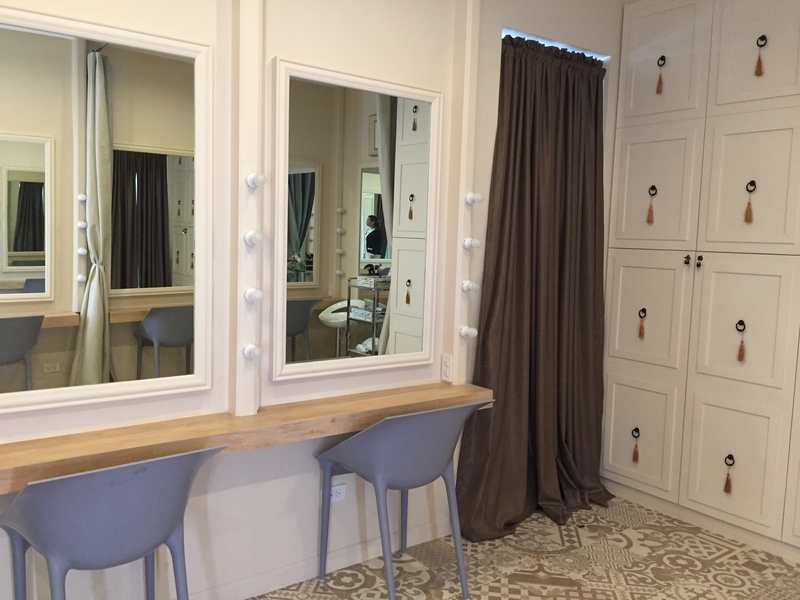 What I like about the place is that it’s very homey and the staff are all so nice! 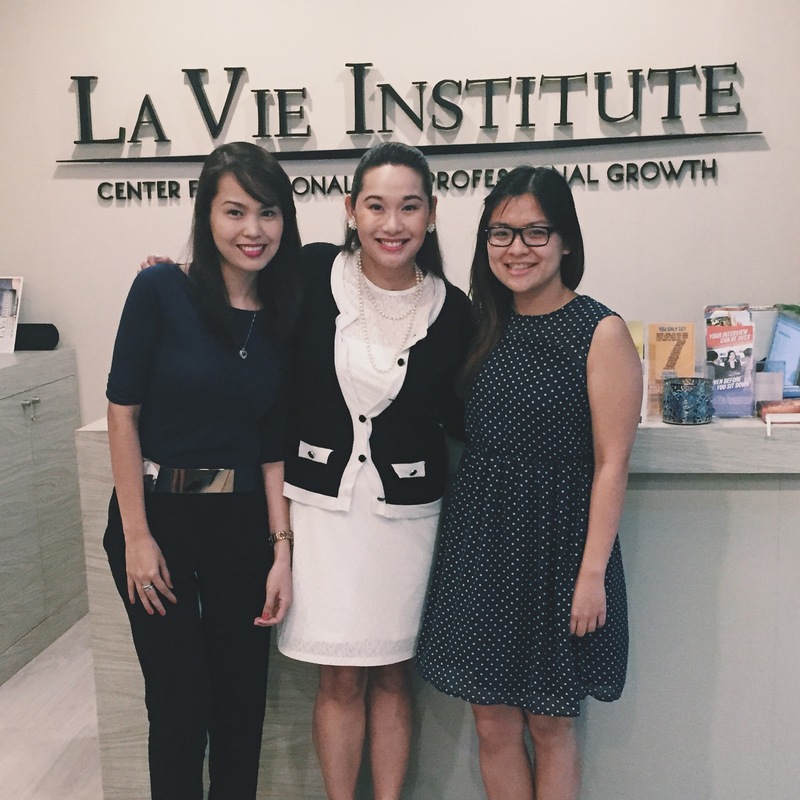 La Vie Institute really makes you feel like you are part of their family. 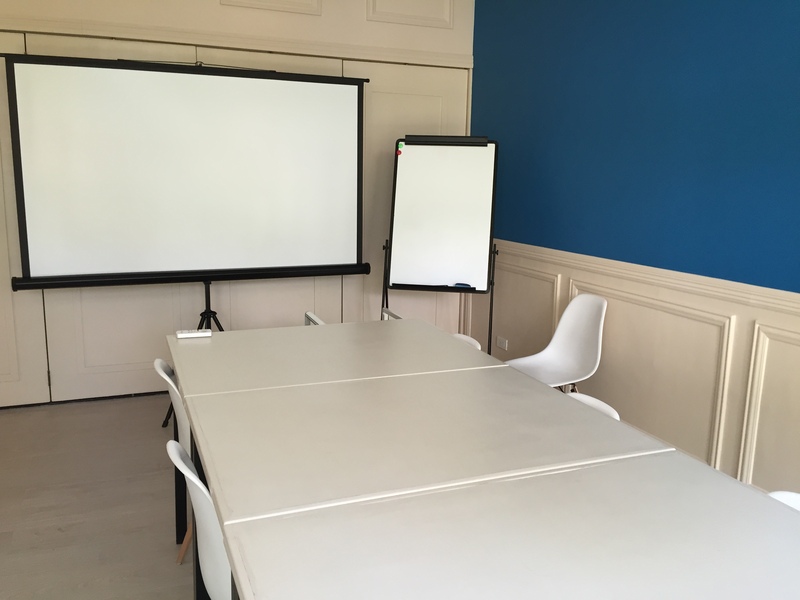 Each class only accepts up to a maximum of 10 participants and this is to make workshops as engaging, interactive and meaningful for all learners. Monica also told me that each student undergoes an assessment to make sure that the teacher adapts and adjusts to the student. I am seriously considering sending my daughter when she turns 4. Classes on personality development, I believe, is something that we, moms, should consider also for our kids and for ourselves. We have been focusing a lot on the intellect, on them being smart. It’s time we place more attention to building their character and the heart.